Accounting firms are ethically and legally obligated to keep their clients’ information and data protected. Due to a recent increase in cyber attacks, accounting firms need to be prepared to defend their valuable information against sophisticated breaches. According to Accounting Today, there are many preventative measures that can be taken by accounting firms, but three actions in particular help create a sufficient plan against major cyber attacks. Beyond implementing data protection software, knowing how to use the software properly is necessary to ensure utmost protection. The first step to any problem is acknowledging the situation. 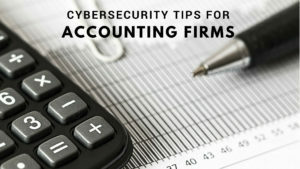 It is important for large accounting firms that employ thousands of employees to properly inform and raise cybersecurity awareness in anyone who has access to the network about the cybersecurity measures and expectations that are implemented within the company. For example, this could include teaching employees how to detect a spam email or link. One simple mess-up could result in a large vulnerability to the entire company. This practice involves having multiple authentication checkpoints while logging on to a data center to access valuable information. By asking for a second or multiple forms of valid identification, accounting firms can guarantee the person accessing the data is authorized. Most companies conduct vulnerability assessments once or twice a year. These assessments should be conducted monthly or weekly, on a regular basis at accounting practices. According to IT Business Edge, these tests should be scanned against every system in the network, internally and externally. Accounting firms remain a large target for cyber criminals because of the abundant personal information stored on their networks. For more information about the prevention of cyber attacks, visit MDL Technology’s website.